2018 will see a new look Lockyer Valley Demons, with the Gatton based club announcing today they have joined forces with the Advanced Breast Cancer Group (ABCG) in a three-year partnership. ABCG is a Queensland-wide service specifically developed to support women with secondary breast cancer and their partners and families. The partnership will see the ABCG branding on a new Lockyer Valley Demons club playing strip, which will be based around the group’s corporate colours. As part of the agreement, the Demons will donate back one quarter of the financial package per year for the duration of the agreement. Lockyer Valley Demons AFC President, Donna Bowers, said the partnership with ABCG will benefit both the club and the community. “Having this chance to give back to the community is something that fits well with our club culture,” said Ms Bowers. “We pride ourselves on being a family club, so it was with great honour that we chose a path that assists an organization as wonderful as ABCG. Advance Beast Cancer Group’s Pia Hirsch welcomed the announcement. “We are delighted to be in partnership with the Lockyer Valley Demons for the next three years. We think this is a very good fit, and will help to let people in rural areas know more about the service we offer to support women and their families living with metastatic breast cancer,” said Ms Hirsch. The Demons are looking to expand, with both women’s and youth girl’s teams planned for 2018. 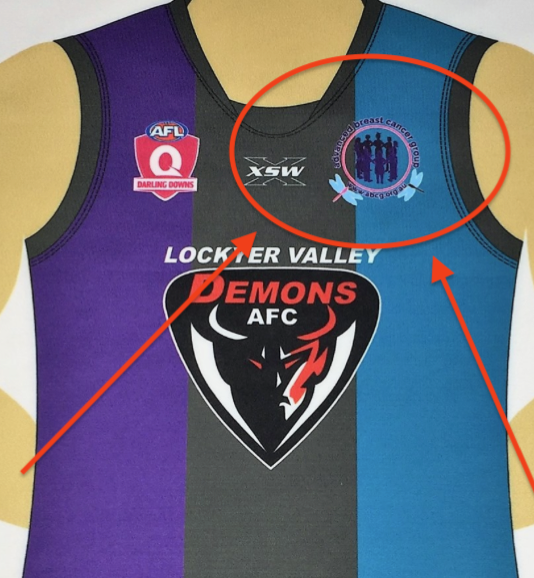 Stay tuned for the official release of the Lockyer Valley Demons new playing strip for 2018.